The 25-date tour will kick off on August 16 in Minneapolis, MN with a stop at Sacramento’s golden 1 Center on Sunday, September 30, before concluding October 6 in Oakland, CA. 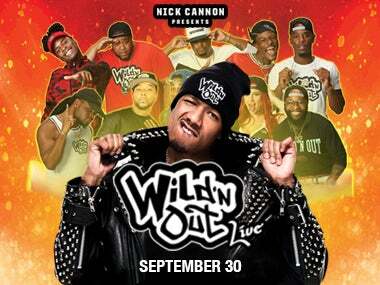 VIP tickets for the tour go on sale Wednesday, June 13 at 10 a.m. local time on NickCannonWildnOutLive.com. VIP packages which include premium seating, meet-and-greet opportunities, pre-show parties, and exclusive merchandise will also be available for purchase. The tour dates go on sale to the public Friday, June 15 beginning at 10 a.m. local time at Golden1Center.com. AEG Presents is one of the largest live music companies in the world. The company is dedicated to all aspects of live contemporary music performances, including producing and promoting global and regional concert tours, music events and world-renowned festivals. AEG Presents operates in North America, Europe and Asia through 15 regional offices that support its tours which include such artists as Taylor Swift, Paul McCartney, The Rolling Stones, Justin Bieber, Katy Perry and Kenny Chesney; produce or support over 40 music festivals, including the iconic Coachella Valley Music & Arts Festival; and owns, manages or books more than 75 clubs and theaters. AEG Presents promotes more than 8,000 shows annually worldwide and conducts business under such globally renowned brands as AEG Presents, Goldenvoice, The Bowery Presents, Concerts West, Messina Touring Group, Marshall Arts LTD, and Madison House Presents. For more information, visit www.aegpresents.com.